The demands on casting and smelting plants differ considerably in the field of analysis and recycling. 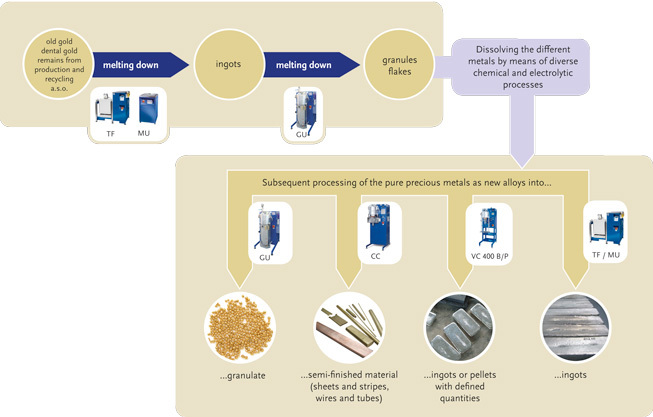 In parts only a few grams have to be molten for sampling, and in parts large quantities have to be molten. Often a certain shape or size is required, such as ingots or pellets. Moreover, the metals and alloys themselves require different handling: Alloys containing copper, for example, should be molten in vacuum or inert gas atmosphere as they tend to strong oxide formation. For other metals or alloys, in turn, open plants are recommended as fumes have to be drawn off, for example.